I had intended to do a piece on carbon capture, but that will have to wait until later today. What diverts the attention is a report that the EU referendum debate is to be brought forward to Monday. The official reason being given is that Hague and The Boy are going to be at the Commonwealth Heads of Government Meeting in Australia. Hague, we are told, wants to "spearhead the Government fight", so the date has been moved to accommodate him. Speculation abounds, though, that the move is a bid to prevent the calls for a vote building up a head of steam, a pre-emptive move to prevent head off a Tory backbench rebellion. However, when you see the tosh being written by Graham Brady - encapsulating the very essence of europlasticism, it is clear that The Boy has got very little to worry about. I believe, says Brady, that a vote would "give the government an overwhelming mandate to seek the return of vital powers to British control. Equally important, it would send a clear message to the people that when it comes to deciding on our relationship with Europe". 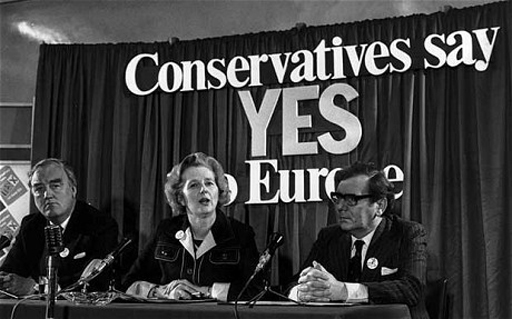 With that, one even begins to suspect that this whole debate is a put-up job – nothing having changed since Thatcher's euro-enthusiast days. Devil's Kitchen, on the other hand, sees the vote on the motion deciding the intrinsic value – or the lack of it - of our entire system of "representative" democracy. He is not wrong there. For a long time I have felt that Westminster has written itself out of the script. As it plumbs new depths, this would seem to prove that contention.